A travelling exhibit featuring reproductions of the famous paleolithic cave paintings of France’s Lascaux cave opened earlier today at Chicago’s Field Museum. Dubbed Scenes from the Stone Age: The Cave Paintings of Lascaux or Lascaux III for short, this is the exhibit’s second stop on its tour around the world and the first time outside France. It was unveiled in Bordeaux last October. Just over 20 years after its discovery in 1940, the original cave, Lascaux I, was closed to the public in an effort order to preserve the ancient art. The carbon dioxide produced by the 1,200 people visiting the cave each day was taking a toll on the paintings. 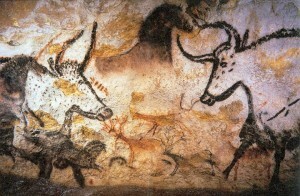 Lascaux II, the first replica, located about 200 meters (650 feet) from the original cave, opened in 1983. Although it contains reproductions of two of the cave halls (the Great Hall of the Bulls and the Painted Gallery), that amounts to only half of the about 2000 paintings found in Lascaux I.
Excitedly, the reproductions in the travelling Lascaux III exhibit include scenes that are not in Lascaux II, and thus haven’t been seen since the original cave was closed to the public in 1963. Even more exciting is that a new project to reproduce the whole cave has begun, with Lascaux IV projected to open to the public in July 2015. In the mean time, Lascaux III will be in Chicago until September 8 before it moves on to Houston, Texas. Other future locations include Montreal, Hong Kong, New York, Shanghai and Los Angeles. For more information on visiting the exhibit, contact the Field Museum. Is it confirmed that the exhibit will come to New York? When?